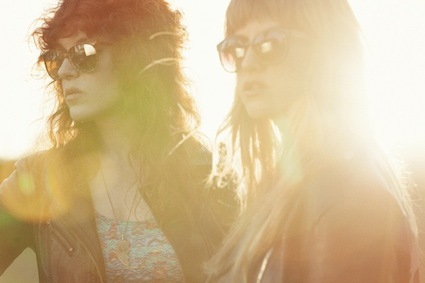 If they met in 2011 at a needlework class , Lindsey Troy and Julie Edwards have quickly left the needles to get back to the instruments and start their own little duo Deap Vally. Both talented and stylish they also seemed to have a quiet precise direction. I will not try to convince you that it is revolutionary contemporary music, because it is not, but, what I can tell you is that they are for real when it comes to be able to electrify the energy and to take it somewhere. It might sound like nothing but to me it is everything. And I seem not to be the only one because from the Coachella team to Muse a few people have taken interest in their duo. So as they are working on their debut album due sometimes this year, Let’s start the week with some new school rock’n roll from L.A. ! …..